A band of torrential rain and gale force winds will batter parts of the north-east today ahead of a “bright and dry” weekend. 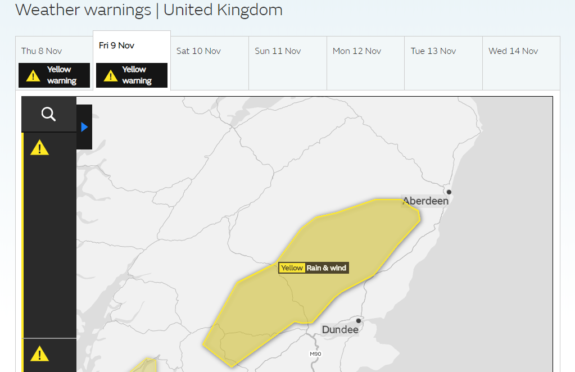 The Met Office has issued a yellow “be aware” weather warning because of the forecast conditions – which is expected to bring around one inch of rain to Royal Deeside. Higher areas are being warned to expect two inches of rainfall in just a few hours. The warning is in place from 1pm today until midnight and is accompanied by warnings of gusts of up to 50mph. Met Office meteorologist, John West did offer some optimism for the weekend however and said: “The weekend will see spells of sunshine, accompanied with some showers. It will settle down following a very, very unsettled Friday. “Friday will see some heavy rain of up to two inches on higher ground. The Met Office warning suggests some homes and businesses could be flooded, with spray and flooding on roads making journey times longer. Some delays to road, rail, air and ferry transport is also expected and delays for high-sided vehicles on exposed routes and bridges. It also warns that some areas may experience short term loss of power and coastal communities may be affected by large waves. Preparing for icy weather, Aberdeenshire council have reassured residents that its 24-hour winter operations room is now up and running and gritters, salt and roads staff are all “ready to go”. It has stock-piled more than 22,500 tonnes of salt and has assured extra help from 120 local farmers to help maintain minor roads when necessary. Chairman of the council’s Infrastructure Services Committee, Peter Argyle, said: “Now that winter has arrived, our residents and commuters should be assured that we are highly prepared. But we are also realistic and looking back at last winter, when there are extreme conditions we do the best we can and road users have to be aware of those conditions and drive accordingly – or sometimes not at all. New equipment has been added to Scotland’s winter fleet as transport chiefs plan how to keep the country moving in the months ahead. It comes following the Beast from the East earlier this year which saw hundreds of drivers stranded on the M80 overnight as a red weather warning for snow was in place across central Scotland. A new electric-powered spreader will be deployed as a patrol vehicle on the M8 and a Hilltip icestriker from Finland will be trialled on the M80. Transport Secretary Michael Matheson said: “We can’t prevent the challenging weather we see during the winter period but our teams work all year round to ensure we’re fully prepared and ready to respond when difficult conditions set in. “The challenges faced during the ‘Beast from the East’ are still fresh in the memory, so we have looked to make improvements across the board, from equipment and treatments to information and advice for travellers. Police Scotland has revised its travel advice to ensure drivers get clear, concise advice on conditions. Assistant Chief Constable Mark Williams said: “Motorists found the numbering system we were using to indicate the severity of travel warnings confusing as it didn’t directly relate to the weather warnings issued by the Met Office. As a result, we’ve decided to replace it with a system which is more specific and targeted. Police also advise motorists to ensure they have sufficient fuel and supplies such as warm clothing, food and water and a charged mobile phone.